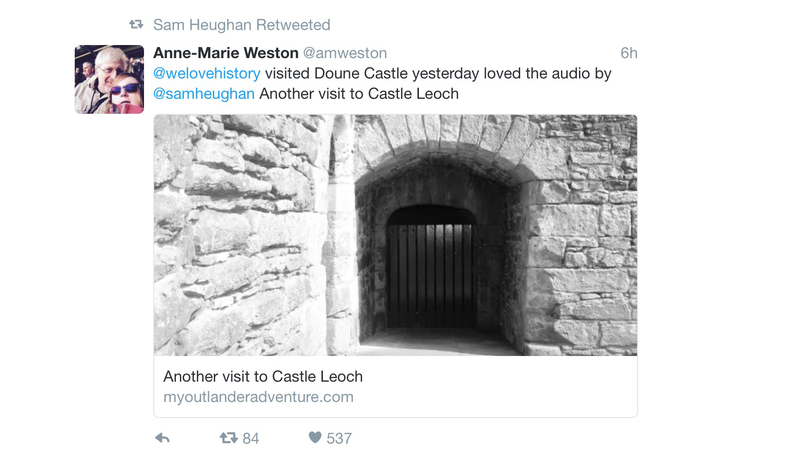 Yesterday I tweeted to Historic Scotland how much I liked the audio by Sam at Doune Castle. Well in the afternoon it was retweeted by Sam. Thanks to this retweet my blog has had more visitors in the past 24 hours. Amazing that one simple gesture can reach so far. Thanks Sam. You’re tearing my guts out Claire! When Claire has been rescued my Jamie, Murtagh, Rupert and Angus they stop by a river. While the horses are being feed Jamie takes Claire to the side to get her to apologise. The scene was filmed in Roslin Glen Country Park by the River Esk near the remains of Mill Lade. My next visit of the day was to Drummond Castle Gardens. These were used in series 2 as the gardens at Versailles. The gardens are open to the public from May to October but the castle is not open to the public. Amazing gardens worth a wander around especially on a lovely warm day. On hot summer day I went for a return visit to Castle Leoch aka Castle Doune. I had heard that there is now an Outlander part to the audio tour voiced by Sam Heughan. The main audio is done by Terry Jones of Monty Python as the castle was used in Monty Python and the Holy Grail. The first place there is an Outlander audio is the courtyard. Sam explains how this part of the castle was used in filming. The next Outlander audio treat is the castle kitchen. The show was not filmed in the castle but the layout of the kitchen influenced the set design. The last place there is an Outlander audio treat is on the second floor of the gate house tower. It describes where the shinty match took place and other views. Before I left Doune Castle I went for a walk round the outside.